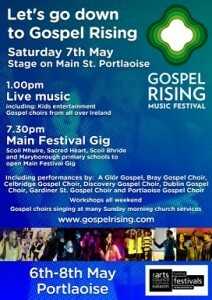 The Gospel Rising Music Festival will take place between the 6th and 8th of May in Portlaoise. On Saturday 7th May on the stage on the main street in Portlaoise, there will be live music at 1pm with kids entertainment. The main festival gig will be at 7.30 pm, with Scoil Mhuire, Sacred Heart, Scoil Bhride, and Maryborough primary schools to open the main festival gig. There will be performances by A Glór Gospel, Bray Gospel Choir, Celbridge Gospel Choir, Discovery Gospel Choir, Dublin Gospel Choir, Gardiner St. Gospel Choir and Portlaoise Gospel Choir. There will be workshops all weekend and gospel choirs singing at many Sunday morning church services.